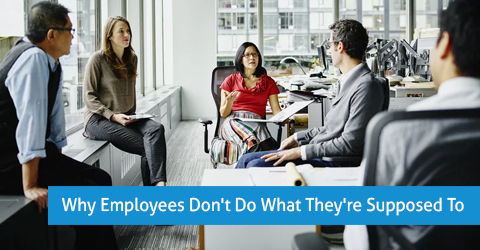 Based on the actual experiences of 25,000 managers, Why Employees Don’t Do What They’re Supposed to Do… gives you proven, straightforward methods that work on real jobs, in the real world. This results-oriented guidebook helps you handle the top 10 situations in which employees don’t perform the way they should, including a detailed analysis of the causes and the plans for preventing the same problems down the road. 1. They don’t know why they should do it. 2. They don’t know how to do it. 3. They don’t know what they are supposed to do. 4. They think your way will never work. 5. They think their way is better. 6. They think something else is more important. 7. There is no positive consequence to them for doing it. 8. They think they are doing it. 9. They are rewarded for not doing it. 10. They are punished for doing what they are supposed to do. 11. They anticipate a negative consequence for doing it. 12. There is no negative consequence to them for poor performance. 13. Obstacles beyond their control. 14. Their personal limits prevent them from performing. As points 1 through 12 are directly within the control of the employee’s manager it is up to the manager to remove those objections and then work on the other items! Featuring fresh insights on outsourcing, temp workers, flex time, telecommuting, and technology, this no-nonsense resource arms you with the people-management skills you need to consistently elicit the highest levels of performance from your workforce. Oases Online tutoring software solutions can help you manage your staff so you have time to read books!